I have always enjoyed experimenting with micing techniques and finding the best sound with each individual instrument. I am currently working on posting some of my ideas on my website at www.jasoncastellente.com. Every live reinforcement engineer and studio engineer wants that “it” factor. The sound that makes the hair stand up on the back of your neck because you know it’s awesome. One mic I experimented with recently was the Audio-Technica ATM650. It is part of the artist series of microphones that were loaned to me from Worship MD owner and representative, Doug Gould. (www.worshipmd.com) The ATM650 features a dynamic element with a hypercardioid pickup pattern and responds to frequencies in the 80-17,000 Hz range. It is basically Audio-Technica’s version of the legendary Shure SM57. My first impression was that it was solid in my hand and it felt well build. I really like the dual-wall floating design that Audio-Technica uses. This helps to kill unwanted handling noise or any other vibrations that could occur due to high sound pressure levels. The flat windscreen on the front was more open then an SM57 but was also more durable because of the threaded head. The design of the head was very similar to the Audix i5 drum mic. I have had countless SM57 windscreens fall off and it is always annoying. This does not seem to be an issue for the ATM650. I am confident that the durable construction will withstand the rigors of consistent use. The first thing I did was call in Andrew Young, my old college roommate who is now a professional drummer. He has great technique so I knew he would be a great candidate to critically listen to the nuances of the ATM650. We decided to start by trying it out on his snare drum. He brought in his maple Pearl Masters 14x8 snare. Of course proper mic positioning is important as well as trusting your ears. I was pleased to hear that it responded well and was clear and crisp while still maintaining fullness and body. It responded well when used on both the top and the bottom of the snare drum. Since it was a 14-inch snare, balancing attack and body can be interesting at times using a SM57. In my opinion, the ATM650 responded better and was clearer with less EQ adjustment. It also had more “life” to it. It was not as focused as a SM57 but also, did not pick up a ton of ambient noise from the room or from the rest of the drum kit. The life I am referring to is probably due to a bump which is centered around 5 Khz in the frequency response of the mic along with a more sharp bump at 12 Khz. I also experimented with the ATM650 on a few different guitar amps. It proved to be a solid choice on pop tones as well as still keeping the fullness and growl when used on heavier tones. It was easy to shape the tone I was looking for both for solo playing as well as contextually within a mix. I am a fan of trying to use the mic and the pre amps to create a tone that will sit well in final mix. I use a variety of mics to get what I am looking for. I don’t think there is any one mic that will give you the “best” tone. I think of different mics as different shades of color in a painting. Trust your ears and go with what you believe to be your best option for the project you are working on. Your loyalty should be to the work of art in the end and not to a specific microphone. The ATM650 is a great “color” to have in your available palate. As far as “bang for your buck” is concerned, the ATM650 keeps up with the going rate of the SM57 and the Audix i5 coming in at $99 retail. 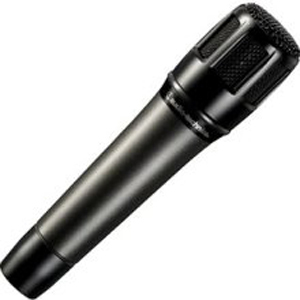 If you are lucky, you might even find the ATM650 for cheaper then a SM57. Like I said, every audio engineer is looking for that “it” sound. This may be the mic for you and your application. I suggest that any live sound or recording engineer check out the Audio-Technica ATM650. Keep going after that perfect sound!